Use this new AMA guide to improve your risk adjustment coding process. Don't let hierarchical condition category (HCC) coding negatively impact your practice. Detailed documentation and compliant diagnosis coding are critical for proper risk adjustment. Risk adjustment practices consider chronic diseases as predictors of future healthcare needs and expenses. Detailed documentation and compliant diagnosis coding are critical for proper risk adjustment. Risk-adjustment parameters to improve documentation related to severity of illness and chronic diseases. Code abstraction guidelines and best practices recommendations to improve diagnostic coding accuracy without causing financial harm to the practice or health facility. More than 75 million Americans are enrolled in risk-adjusted insurance plans. This population represents more than 20% of those insured in the United States. Insurance risk pools under the Affordable Care Act include risk adjustment. CMS has proposed expanding audits on risk adjustment coding. Meticulous diagnostic documentation and coding is key to accurate risk-adjustment reporting. 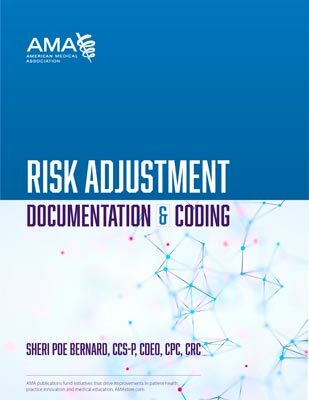 Five chapters delivering an overview of risk adjustment, common administrative errors, best practices, an alphabetized, topical review of clinical documentation improvement and coding for risk-adjustment, and guidance for development of internal risk-adjustment coding policies. Three appendices offering mappings, tabular information, and documentation and abstraction training tools for coders and physicians that include an alphanumeric mapping of ICD-10-CM codes that risk-adjust to HCCs and RxHCCs for Medicare Advantage plans. Exclusive content for academic educators: A test bank containing 100 questions and a mock risk-adjustment certification exam with 150 questions.